In a fortnight, Jodie Whittaker becomes the fourth Doctor Who to abandon the traditional Saturday night fixture. Only 14 days to go. She is also the second Doctor to have a first episode on a Sunday. And gosh, I’m excited. Didn’t expect that. Just wish they hadn’t borrowed McGann’s “It’s about time” tag. The trailer was popping up between pretty much every programme on BBC1 the other day. It has displaced the glass ceiling teaser. Still no time specified but Jemma Coleman’s child abduction drama The Cry is moving into the 9pm slot after Bodyguard finishes tonight. 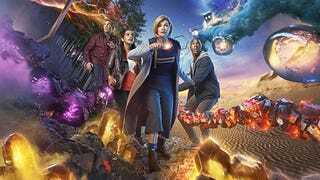 Will Doctor Who go after Countryfile or before? Or which side of the Strictly results show will it fall? Showrunner Chris Chibnall was publicly critical of John Nathan-Turner during the final years of the classic series. Will he be hoist on his own petard? Only time will tell, but he has laid out a manifesto for the show in Radio Times. Meanwhile, Jodie has been revealed as a bit of a dipso. Will she pick up Colin Baker’s Doctor Huge nickname? Will Dodo return to teach her how to speak proper? Digital Spy has a fun item on the Doctor’s age. I have a quibbly-wobbly timey-wimey twitch about the First Doctor’s age. Pretty sure that publicity material pegged Hartnell’s Doctor as being about 750, but then post “renewal” Troughton’s Doctor was 450 (because he was suddenly younger). I still think he got nobbled by the Time Destructor, but hey ho! Clue: it isn&apos;t Paul McGann&apos;s.
Did I mention there are only two weeks to go?